A study was conducted to analyze the differential expression of temperature induced protein synthesis in two silkworm races exhibiting different temperature tolerance. A temperature tolerant race namely Nistari and another temperature non-tolerant race namely CSR2 were used for the study. Experimental animals of both the races were subjected to high temperature treatment at 36°C and 40°C for two different durations, viz., 1 h and 6h on the 2nd day of 3rd, 4th and 5th in star. Proteins purified from the haemolymph collected from the treated larvae immediately after treatment and after four recovery periods (1h, 6h, 24h and 48h) were subjected to SDS PAGE analysis to observe the protein kinetics. The protein profiles of both the races under various treatments when compared with control indicated deviations mostly in the 68-97 kDa region apart from the appearance of new bands. Both the races showed similar protein banding patterns, though the intensity of the bands varied with treatments. Induction of absolutely new bands was observed in the of 97-205, 68-97 and 29-43 kDa molecular weight region possibly representing Hsp: 100, 90, 70 and 34-35kDa. Families. The results are indicative of the differential capability of the races to respond to heat shock by temperature induced protein synthesis. The study results suggest the possibility of using heat shock protein based breeding strategy for inducing robustness in productive breeds. 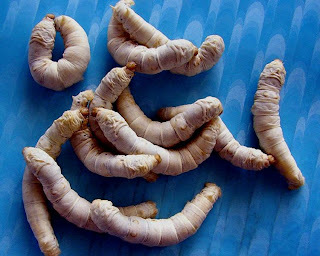 I started this blog in honour of the silkworm, a tiny animal belonging to class insecta which produce one of the most sought after materials by man- silk. I wish to cover everything related to this humble creature. Its history- more than 4000 years old; the emperors who adored it- Huang- De of China to Tippu of India, the path it had travelled - the dry deserts of Takli makkan to the snow clad peaks of Himalaya, its biology - of interest to entomologists, microbiologists, pathologists, anatomists, physiologists and molecularbiologists; its economic uses - of interest to women, men the rich and the poor and finally its future possible role on the fate of many countries. Please visit this blog again.